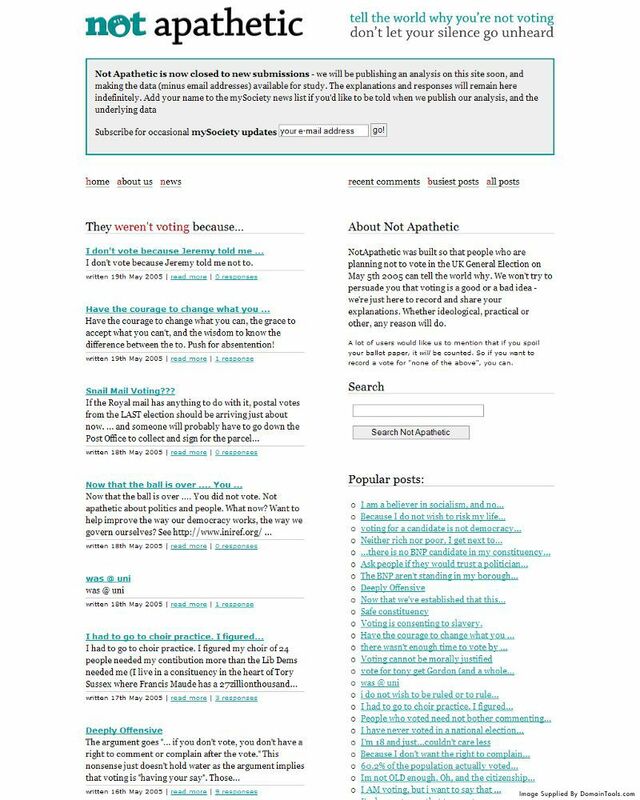 NotApathetic was a mySociety project, built so that people who were planning not to vote in the 2005 UK General Election could tell the world why. NotApathetic didn’t try to persuade people that voting is a good or a bad idea – it was just there to record and share explanations, whether ideological, practical or other. It aimed to give a voice to the 40% of people who don’t vote, but who are not generally given a platform. It also encouraged some thoughtful discourse into why some members of society feel unable to participate in electoral process – you can still browse the archive of 2005 responses here. Why have we closed this site? Would you like to run NotApathetic yourself? We ran it as a one-off project for the 2005 UK general election, but we believe a site like NotApathetic would be useful at any election; we just don’t have the time to do it again ourselves. If you’re at all interested in taking it over and running it, get in touch and we’ll tell you what’s involved. We are a not-for-profit social enterprise. We are based in the UK, where we run a number of projects designed to give people the power to get things changed; we also work internationally to support partners who deploy our technology in countries around the world. This work is partially supported by providing software and development services to organisations that can benefit from our experience in civic technologies.